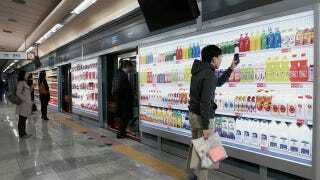 I would never do my grocery shopping inside a subway station. The smells? The rats? The slime? Gross. But what about a virtual supermarket where you scan QR codes of items and have it delivered to you by the end of the day? They have that kind of virtual supermarket in a South Korea subway station (which is admittedly cleaner than a New York subway station). European grocery chain Tesco has 'opened' a store where the items are just pictures lined against the walls of subway stations and the currency is QR codes. Well, no, you still have to pay the mans his moneys but the method is different: scan the QR code to add it to your shopping cart, checkout and then have items delivered to your home by the end of the day.